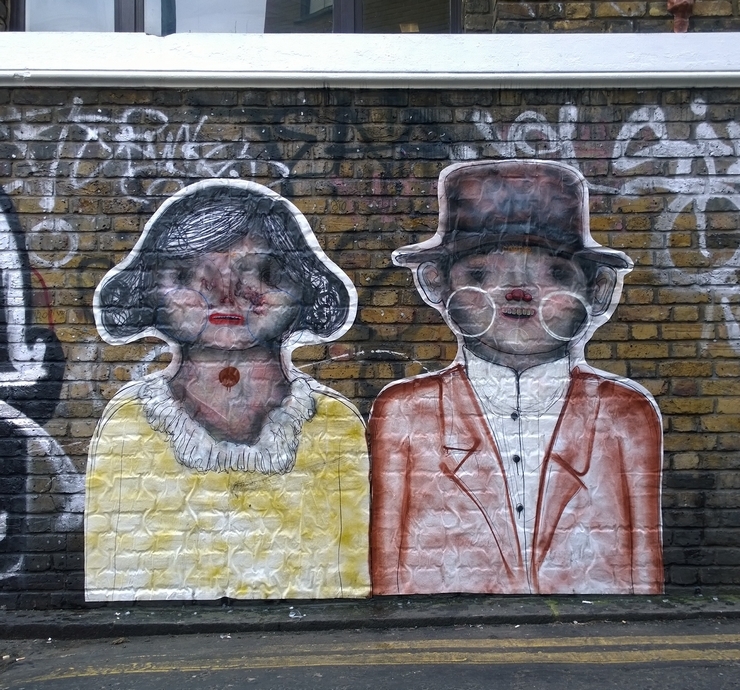 Nothing quite beats the excitement of coming across unexpected new street art on the back streets of Shoreditch. On my bicycle this afternoon I was delighted to find what appears to be work by Mila K from Sheffield. Now, I have never seen Mila K’s art in Shoreditch before and only became familiar with this artist’s work on my first ever visit to Sheffield last Summer. Dotmasters got back to basics hitting Shoreditch and other London areas hard with his Rude Kids stencils last week. I have been finding new examples nearly every day this week and today was no exception, we discovered this little beauty during the morning tour. On the Shoreditch Night Street Art Photography Tour tonight I went into a back yard which I had been in only earlier in the day and found a painting so new in fact the emulsion was still wet. This macabre portraiture is by Corpse, Corpse’s work was first seen in Shoreditch last year and it bore quite a resemblance to Antony Lister’s clown faced super heroes but this looks much more menacing. A number of paired paste ups found during the morning tour was an early warning that Corpse is walking the streets of Shoreditch again. Multi layer stencillist is exploring political similarities with this juxtaposition of Obama and Kim Jung-On which must be evident to himself if no one else. This LIchtenstein-esque superhero is tagged Solo, the image itself has been seen on the streets previously by other artists. Exciting exciting exciting, keep ’em coming! This entry was posted in News and tagged "Mila K", Artist, Corpse, Endless, installation, London, mural, painting, Shoreditch, solo, Street Art on 01/26/2015 by Shoreditch Street Art Tours.